Suzuki is a Japanese manufacturer of cars, motorcycles, ATVs, and marine engines. It also makes wheelchairs and some other small internal combustion engines. Although Suzuki was established in 1909, it did not have a logo until 1958. During the first 50 years of its existence, it specialized in producing looms for weaving silk and cotton. The need for Suzuki logo arose only when the company started to build four-stroke engines and presented its first car in 1955. 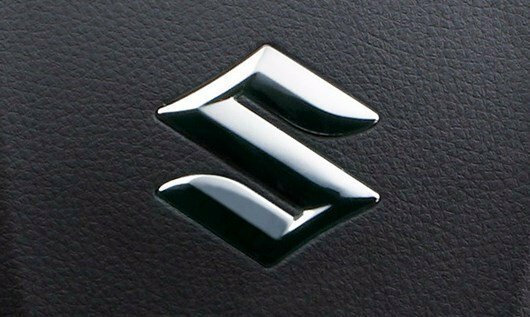 In contrast to many other carmakers, Suzuki has not introduced any changes to its emblem ever since it was designed in 1958. The only exception is color and the place of Suzuki inscription. Simple and minimalistic, yet extremely appealing and recognizable – all these features are characteristic to Suzuki logo. It consists of two parts. The stylized letter “S,” which is the initial of the automaker’s name, has a peculiar shape. Although the letter itself comes from the Latin alphabet, in this case, it resembles a hieroglyph and associates with Japan. Sharp edges and chopped forms create a distinctive visual sign. The letter is completed with the carmaker’s name written in customized Helvetica font. This part is often omitted, in car badges, for instance. 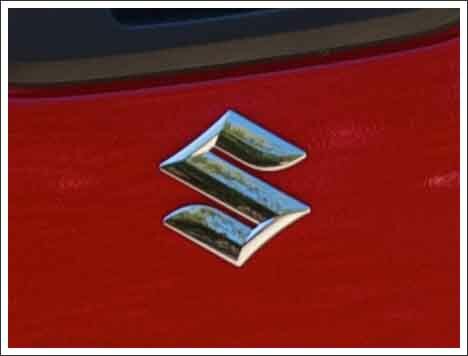 What types of vehicles bear the Suzuki symbol? In addition to automobiles, the Japanese company manufactures motorcycles and outboard marine motors. The current automobile lineup includes over 12 models, from Celerio, Ignis, and Swift to Baleno, Vitara, and Ciaz. The range of outboard marine motors consists of 4-stroke outboards and 2-stroke outboards, while the motorcycle lineup comprises around 40 models. A warm and positive color red is energizing, it motivates to take action, boosts our physical energy levels. It is the color of physical movement. Psychological research has shown that red increases our heart rate and blood pressure. Blue represents peace and tranquility. It is also associated with loyalty and honesty; it is the color of truth. This color combination was not used always: originally emblem was designed in black and white. And the badge incorporated into the cars is silver and shiny. In 1955, the first auto Colleda COX 125cc was launched. The company’s name was changed to Suzuki Motor Co., Ltd, and three years later, Suzuki logo was introduced. The design was completed with four strokes, which represented wheels and were to show the company’s connection to the auto industry. Later black “S” was replaced with the red one – it appeared to be more appealing to the customers. We could also mention the fact that initially, the word “Suzuki” was on the right side, and only several years later it moved below.